Fit people doing fit things with their fitness. First things first... Was there actually a Saint named Cloud? I was skeptical. But apparently there was a St. Clodoald, who I assume got sick of people always screwing up his name at Starbucks and just boiled it down to Cloud. Sounds plausible. You're welcome for that history lesson, by the way. The events were pretty cool, but since I showed up in the middle of the weekend, and didn't finish, I'll leave the actual event coverage to the professionals at FloElite.com . Click HERE for links to their coverage. I was there to just enjoy the day, and maybe see some exceptional CrossFit athletes. I'm always impressed by how much top-level strength some of these athletes have, especially since some of them are a lot smaller than they look on TV. Last year at the Arnold, I was shocked at how regular-sized Mat Fraser, Dan Bailey, and Josh Bridges were (No offense, guys). Since that day, I always assumed most of these guys were about that size. To make matters worse, not a single vendor I had asked brought any 2XL t-shirts. Fortunately, the Invictus booth had a couple on hand and they hooked it up for a big guy... Props to Invictus. Until they saved the day I was sure I was gonna get run out of here for having too much Mass and no souvenirs. I felt all alone in my hugeness. Then I saw Ron Ortiz. Ron is a Master's athlete. Ron is also a goddamn truck. 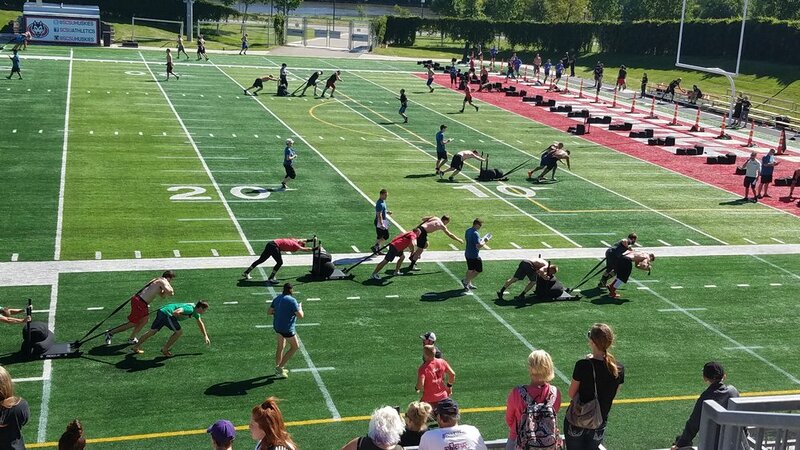 The rest of the day was filled with fitness stuff... People pushing sleds, running, lifting barbells and walking on their hands... It all looked super, super-hard. And confirmed my suspicion that I'm definitely #toohugeforfitness. But I just might have to put a team together for next year. CLICK HERE to check out the rest of the story in the 25th Episode of The Massenomics Podcast.